My pack after stopping for lunch. Don’t get me wrong. I love hiking with people–and I think that comes out when I’m guiding guests, introducing them to the wonderful New Mexico outdoors. But on days off, I sometimes give myself the gift of a solo outing. Solo outings (hikes or snowshoeing, fishing, cross-country skiing, etc.) are different. They are quieter. They are alternately faster and very, very slow. They are seldom on-trail the whole time because I’m free to embrace wandering over to interesting-looking trees, rocks, or hillsides. Heck, sometimes they even involve napping. I gave myself that gift yesterday to hike an area in Pecos Wilderness that I hadn’t visited in donkey’s years. On a guide trip earlier in the week , I’d seen the ridge line in the distance aflame with golden aspens. High winds and rain are predicted for today, so I carved time out of a busy schedule to visit the yellow trees before they would be stripped of their leaves. Nights are getting colder in the high country, and I chose to start later for my trailhead. An hour’s drive brought me to a lesser-used parking area than the ones closer to Santa Fe. The only other truck in the lot appeared to have been occupied by a backpacker the previous day. 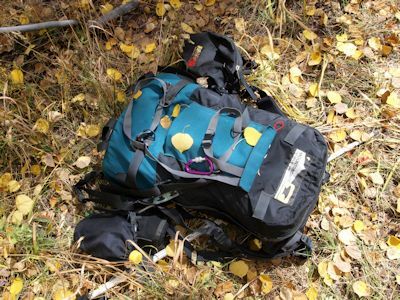 I double-checked the contents of my well-provisioned pack, chucked a little extra weight, and strode off. The creek had a healthy amount of water, but I had only to cross it once before the trail headed upward toward “my” ridge line. Memory and old maps being what they are, I discovered that the route had changed somewhat in the intervening years. The trail now had additional switchbacks to reduce the grade (a distinct improvement) and no longer ran straight up the crest of the ridge, but wrapped around to give views of the other side. Between the trees, I had glimpses of fiery yellow aspens illuminated in little patches on the mountainsides around me. ‘Aren’t you afraid to go out by yourself?’ I’m often asked this by guests and even friends. ‘Afraid of what?’, I ask back. Yes, there are wild animals and I saw bear tracks on the trail yesterday. But I know something of these critters, what to do on encounters, and am prepared. Yes, I go places that I might get lost, but I have my maps and emergency supplies. I have considerable practice at using the former and not requiring the latter. Creepy 2-leggers are notably absent as are most people where I choose to go. I’ve had more trouble with unhappy encounters in town than out in the wildlands. A more worrisome fear is that I will have some accident–a twisted ankle or such. So there are some places where I choose not to go by myself anymore: slick-rock basalt canyons in fishing boots are non-solo events these days. But for everywhere else, I tell someone where I’m heading and when to expect me back knowing that I always carry enough stuff to self-rescue or wait for help. And then I go because the rewards are more than worth the risks. As I was making the summit of the ridgeline, a flicker of movement caught my attention. A mule deer doe was as surprised as I at the meeting. But because I was alone and quiet, she simply watched me from behind a tree. She was so convinced that I didn’t see her that I was able to take off my pack, dig out the right camera lens and get off as many shots as I wanted before re-shouldering my pack to leave. That sort of magic only happens to me on solo outings. 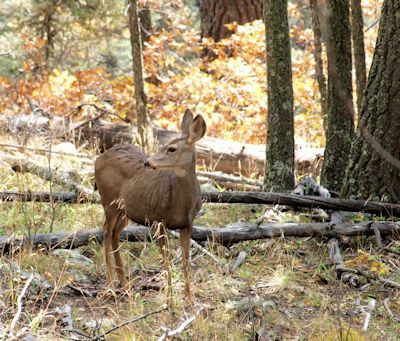 This entry was posted in Human interaction and tagged alone, hike, hiking, nature, New Mexico, outdoors, pecos wilderness, solo, solo outings, wildlife, women. Bookmark the permalink. Truely is magic to experience your hike with you sitting in my office in Austin. Thanks for sharing. 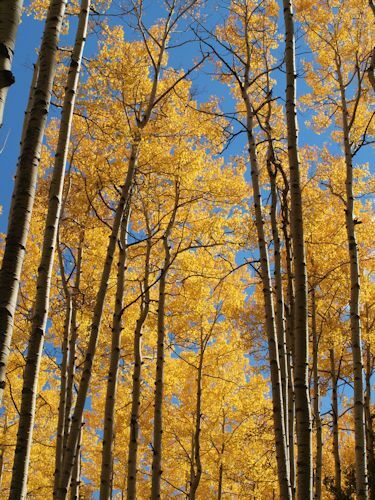 Love the golden aspens. I can just hear their whisperings. Voices of the wilderness – best company there is. Hi Barbara! Yes, we had a great adventure in the snow. You and Willow should return and we’ll do a wander in the woods together!